More here Venezuelan officials claimed a world record Saturday for making the largest pot of soup, a giant cauldron of stew prepared by President Hugo Chavez’s government.The hulking stainless steel cooking pot, set up outdoors in downtown Caracas, contained about 3,960 gallons of “sancocho” stew, Food Minister Rafael Oropeza said. 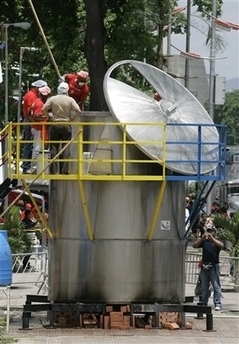 That would dwarf the current record-holder listed on the Guinness World Records Web site, a pot of 1,413 gallons of spicy soup prepared in Durango, Mexico, in July.Oropeza called it “Bolivarian stew” — a play on the name of Chavez’s socialist movement, named in honor of South American independence hero Simon Bolivar. He said it was enough to feed 60,000 to 70,000 people. London Free PressBreakfast may be the most important meal of the day, but it’s definitely not this important.Witnesses said a driver who lost control along a Highway 401 on-ramp yesterday was eating cereal when the vehicle careened through a grass median and jumped into [60 mile]-an-hour traffic, causing a three-vehicle crash………………………..No one was seriously hurt.